Thanks to our Sponsors and Committees! If you know it (History), you know we are talking about. If you will not be able to attend TNT2005, you will have a new opportunity next year..........See you in MINATEC (Grenoble, France)! The rapidly emerging areas of nanoscale science and technology are focussed on the design, fabrication, and characterization of functional objects having dimensions at the nanometer length scale. New advances in this emerging area are expected to have long range implications in a wide variety of different scientific and engineering disciplines. The importance of nanoscale science is growing worldwide and it is now widely recognized as a critical component to the future growth of the world economy. In response to the growing awareness of the importance of nanotechnology, many conferences are being organized worldwide to discuss the latest advances. Among those, the series of conferences "Trends in Nanotechnology" (Toledo-Spain, 2000 / Segovia-Spain, 2001 / Santiago de Compostela-Spain, 2002 / Salamanca-Spain, 2003 / Segovia-Spain, 2004) has become a key meeting in the nanotechnology field since it brings fresh ideas on organisation, first level speakers, and an environment suitable to keep discussions, ideas exchange and enhance scientific and personal relations among participants. TNT2005 is being held in large part due to the overwhelming success of earlier Nanotechnology Conferences, TNT2000, TNT2001, TNT2002, TNT2003 and TNT2004. TNT2005 will be organized in a similar way to the five prior TNT conferences. In 2004, this five day conference attracted around 370 scientists worldwide and featured ~70 talks ranging from 15 minutes to 30 minutes. Approximately 250 posters were presented. The aim of the "Trends in Nanotechnology" conference (TNT2005) will be to focus on the applications of Nanotechnology and to bring together in a scientific Forum various groups throughout the world working in this field. During this event, specific sessions on topics of interest will be organised with Research labs, Institutions or Networks such as iNANO (Denmark) / Nanobiotechnology, NIMS (Japan) / Nanomaterials or GDR-E (Europe) / Nanotubes. 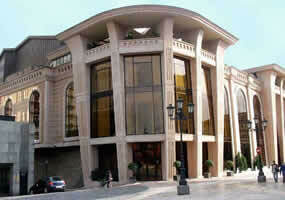 The conference will be held in the "Principe Felipe" Congress Centre.